Home » Immigration » Snipers, Sharpshooters, and Mines, or a Border Wall? No, the world is not coming to an end. All Trump did was lay out a plan to enforce the border. He didn’t advocate that we use snipers, sharpshooters, or land mines to stop unwary illegals and their DACA-bound kids. He might as well have. Instead we got a border wall, which is a pretty benign solution to a very big problem that a fading number of conservatives being criticized as Trump’s base still want to put a stop to. Compared to the venom spewing from liberal mouths outraged that anyone would challenge the Democratic Party on immigration, the appearance with Mexico’s Nieto and Trump’s follow-up speech seemed positively pastoral. Had Trump suggested we use snipers, sharpshooters, and mines would anyone in Congress have noticed? The political outcry after Wednesday’s double hit to liberals was minimal thanks to Capitol Hill’s long, taxpayer-paid summer break. That will change after Labor Day. Congressional seats are on the hook and the opportunities to step in front of Trump-hostile press cameras will be endless. It didn’t matter what Trump said. Liberal Democratic hate was focused on the Republican nominee long before the convention. An American success story has far less utility to the left than 11 million illegals waiting to be forgiven. Meanwhile, Democrats lament the lack of funding for schools and low-income communities here at home. If there is less to spend on citizens because we sent money to Mexico, that gives them more to blame Republicans for. Border wall is the end of America? Republicans have said similar things about Obama’s demagoguery. We’re still here. So are 11 million illegals. The Republican nominee is already being blamed for everything from endorsing hate to hastening nuclear Armageddon. Would suggesting that we place a sniper here or sharpshooter there make a difference in how he is being portrayed? It would show we are serious about immigration. It would prove we are not a nation of bumbling, indecisive oafs who let illegals control our government’s policies. If Trump were really a seething, racist demagogue he would propose exactly that kind of solution. Instead, there was a mannered exchange with Mexico. We heard a plan for a simple barrier to slow things down. His words didn’t sound dark or evil. They didn’t sound like a threat. ‘Tis the season for budget wars and pre-Christmas shutdown threats. Building a border wall is divisive so we are hearing every argument imaginable to stop it, from the mundane to the creative. 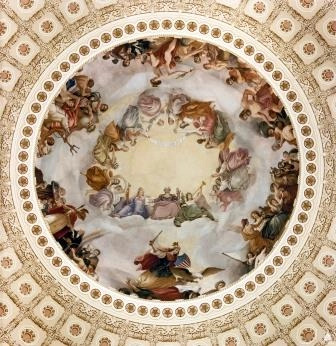 Senator Patrick Leahy (D-VT) chose the first approach. He slammed the barrier proposal as “bumper sticker budgeting” to “save face for one of President Trump’s failed campaign promises.”7 This makes little sense when we are only 11 months into the first term and border wall budgeting is still on the table. Money is an excuse, not the reason to stall the project. There is another problem that’s more difficult to reconnoiter than finding room in the Federal Budget. We are also alarmed by policies that protect criminals who come across the Southwest border by extending sanctuary protection from federal authorities. Paying for public services including education is expensive for taxpayers as well, though when the cash comes out of our own pockets it doesn’t seem to bother liberal lawmakers nearly as much. So what should we do? Monitor the border with drones and hold private landowners responsible when illegals cross their property, make them an offer they can’t refuse, find a way to make a less intrusive border wall, or keep doing what we’ve been doing for years and suffer the consequences? That last option is unacceptable. It’s also the one I’d put my money on as the budget battle segues to midterm campaigns. UPDATE January 28, 2018: instead of a border wall, spend on technology for New York? Perhaps New York’s Senator Chuck Schumer was too busy playing games with border wall funding to attend the meeting where they talked about fentanyl coming across the Southwest Border. The senator complained about “illegal drugs flowing into border crossings like Peace Bridge and Buffalo-Niagara airport”10 and asked that we pass H.R. 2142, the INTERDICT Act to provide high-tech scanning equipment to Customer and Border Protection agents. We’ve tried for years to stop the illegal drug trade, but politicians are no match for the black market in drugs, guns, human being, or anything else. Profit is also going to win and drug smugglers are very good at adapting their methods. That’s why a border wall will always make sense except for one thing. It will reduce the flow of Mexican nationals who are encouraged by Democratic immigration policies to come to America. The party can’t have it both ways, but I suspect if push comes to shove illegals will win out over our drug interdiction efforts just like Democrats used them to shut down the government. 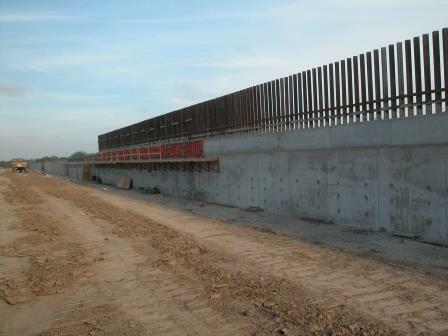 We spent $2.3 billion on border fencing from 2007 – 2015. 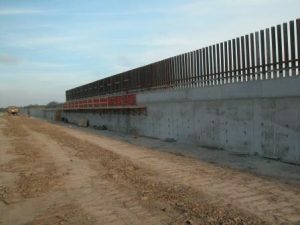 535 miles were constructed from 2005-2015.15 While Democrats beat their chests over Trump’s plans for a border wall a March 15, 2018 Government Accountability Office report makes it clear that the administration’s order means we will “replace and add to existing barriers,”16 not build a brand new wall that never existed in the first place. So why is a border barrier a problem now? Is it the word “wall” that Democrats find so offensive, is it the fact that border security is now in the spotlight instead of being carried out quietly in the background, or the fact that a Republican president liberal America will do anything to portray as racist and anti-immigrant is now overseeing border security? The joke was on Democrats and dreamers when the House and Senate agreed to a historically massive spending bill before fleeing home for Easter vacation. Trump got a middling $1.6 billion for his border wall. It’s hard to say how many non-citizens were looking for a helping hand from Democrats who blurred the distinction between DACA-eligible and those who needed to apply for or renew their protection. 800,000 is a popular number and the figure cited by the Congressional Hispanic Caucus18 after Trump canceled the program. That means each dreamer was traded for about $2,000 worth of border wall. If we could apply that sum to every illegal in America, we could have Trump’s wall built in no time. I tried hard to find a positive after a week of lies and propaganda about border enforcement that ended with the Washington Post pointing a blameful finger at Time magazine over its “Welcome to America” cover. Then it hit me. So many Americans are so angry over what they are told to believe about our actions at the Southwest border that no matter what we do the fallout can’t get any worse. You can only push these things so far and like other issues politicized to the point of abject stupidity we will eventually wear this one out. If Trump gets on national television tomorrow and suggests we install snipers and sharpshooters at the border there is nothing the left can respond with that hasn’t already been said. They’ve already pulled Nazi Germany out of their trick bag. That’s about as far as you can go and a lot farther than the administration deserves for making sure these children are fed, have a roof over their heads, and aren’t dying in the hot sun. That’s better than they got from their parents who brought them on this journey for nothing. UPDATE October 22, 2018: is new mob from Central America election meddling? Now we are right back where we started. No border wall. Another mob of migrants headed our way. An election is almost here in which immigration is a pivotal issue. Whether by accident or design it’s time to call this what it is: election meddling from Central America. That last phrase is what matters most to Democrats who seem intent on a much larger plan than quasi-legal immigrant assimilation. Close the border: doesn’t the rule of law do that? The Trump administration has threatened to close the southern border if Mexico doesn’t halt the newest Central American mob. “Close the border” should be an oxymoron. We have laws to govern who comes and goes that are now off limits. Democrats have called effective border security “militarization of the southern border” since the Bush days.22 Now they refuse to agree to any solutions short of open borders and assimilation. Since Trump took office we have wasted countless hours and taxpayer dollars trying to find evidence of his collusion with Russia in the 2016 election. Now Republicans have an issue they can throw in their opposition’s face if they have the spine to do it. Is refusing to protect the sanctity of our borders and forcing a pre-election confrontation a stunt designed to manipulate voters? Probably not, but given the ridiculous rhetoric governing how we handle foreigners who believe it is their inalienable right to live in America the GOP should label it exactly that. Desperate Democrats are so eager to crucify Trump for the shutdown that they criticize the president for not forcing Mexico to pay for the barrier. He never said who “most Americans” are, but it’s safe to assume they aren’t the ones who put the president in office. In two days the new Democratic House takes over. This is the party’s chance to show Trump who is boss and pass a bill to force Mexico to pay. Trump went out on a limb yesterday. He risked anger from both sides with a plan that solves a multitude of problems. As expected, Democrats said no. They chose to obstruct a solution for the very same children in jeopardy that they have used against this president and his party time and again. Democrats’ open border stance has never been a secret, but now we know for certain that the only border security fix they will honor is no border security. No matter what they say, unless they present a bill to open the gates wide and admit every single foreign national that arrives at the Southwest border they are lying. From that perspective we did get some honesty yesterday. We went from obstructionism to outright, no holds barred refusal of a solution that they would probably agree to if it came from any other president. The problem for Democrats is that this forces a nuclear response from the president. One way or the other he is going to reopen the government. With another caravan allegedly forming, I’m placing my bet on his threatened national emergency. Don’t believe anything you hear from members of Congress about how the just-passed 2019 appropriations bill spends on border security. It doesn’t. Lawmakers preserved the security status quo and agreed to spend more to take care of illegal immigrants. This “down payment” sounds more like the kind of sell out that lost Republicans the House last year. Legislators like to use “unprecedented.” When you hear it, rest assured that nothing new is happening. We wouldn’t have to spend tens of billions on border security if Congress did its job instead of engaging in this protracted, partisan open borders vs. enforcement struggle that plagues our politics and wastes taxpayer money. $414 million will go to “urgent humanitarian needs”29 for the people we are trying to keep out. That’s not border security. It’s spending on care, feeding, and housing for people who should have been stopped before they got here. So far the left is winning. Blame the Republican Party for that. Had the GOP kept the House or even stood behind Trump and done more to secure the border when they had a majority we wouldn’t be facing this open border crisis. Democrats pursuing open borders in the name of security are forcing confrontations and putting lives at risk. Saying no to illegals voting is a frightening development from a party whose stock in trade has been protecting our democracy from Trump and Russia. There is no crisis because the goal of their destructive game is to ensure we can’t manage the influx of aliens they encourage with promises of asylum and assurances that Trump’s hateful America will one date come to an end. The numbers work to their advantage. So far we don’t have much reason to hope that we can stop this legitimate threat to our democracy before the party gets what it wants. That’s a tough standard to live up to thanks to obstructionist, open border, pro-amnesty Democrats who just scored another victory against American sovereignty. Decency is apparently off the table as well. To kick off the deluge of anti-Trump press releases we can expect in the wake of Nielsen’s departure, Committee on Homeland Security Chairman Bennie Thompson (D-MS) added gleeful insult to the surprise announcement. What Thompson didn’t admit to the American people is just how valuable this crisis created by Democratic rhetoric is to his party. Without Democrats and their Federal Court enablers there would be no crisis at the border, but in Washington blame is an opportunity to be passed around. The question now as always is why Democrats are so good at this and why the Republican Party is so impotent in the face of ridiculous pro-immigrant propaganda. Another caravan is on the way. With it arrives another opportunity for Dems to dig their claws into the next DHS chief while they deny the American people their right to a sovereign nation.